Carol Seery investigates the nature of stuttering and fluent speech to improve our understanding and intervention with individuals who struggle to speak more easily. Her primary areas of research interest are in subtypes of stuttering including the differential diagnosis of stuttering from other fluency disorders, and the psycholinguistic factors affecting fluency and stuttering. Seery collaborated with scientists at the University of Illinois at Urbana-Champaign in a large multi-site research project funded by the National Institute on Deafness and Other Communication Disorders, National Institutes of Health. Seery teaches the graduate course on Stuttering and Fluency and the undergraduate course on the Bases of Voice and Fluency Disorders. 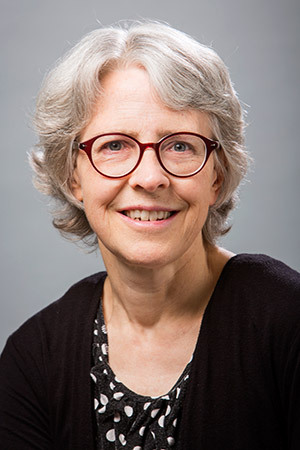 She has co-authored an introductory textbook with Ehud Yairi, Ph.D., titled Stuttering: Foundations and Clinical Applications (Pearson Publishers). Seery serves on the editorial board for the Journal of Communication Disorders. Seery received the College of Health Sciences Dean’s Research Award in 2002. Seery, C. H. (2016, September). Differential diagnosis of early childhood stuttering and other unusual disfluency patterns. Seery, C. H. (Ed.). , 95-101. Ambrose, N., Yairi, E., Loucks, T., Seery, C. H., & Throneburg, R. (2015, September). Relation of motor, linguistic and temperament factors in epidemiologic subtypes of persistent and recovered stuttering: Initial findings. Journal of Fluency Disorders, 45, 12-26. Seery, C. H., & Yairi, E. (2015). A reply to Coleman and Tsai. Journal of Fluency Disorders, 46, 61-62. Yairi, E., Seery, C. H., & (2015). Stuttering: Foundations and clinical applications. 2nd. Yairi, E., & Seery, C. H. (2011). A Reply to Klein and Donaher. Journal of Fluency Disorders, 36, 59-60. Yairi, E., & Seery, C. H. (2011). Stuttering: Foundations and clinical applications. Pearson Higher Education. Sturm, J., & Seery, C. H. (2007). Speech and articulatory rates of school-age children in conversation and narrative contexts. Language, Speech, and Hearing Services in Schools, 38(1), 47-59. Seery, C. H., Watkins, R., Mangelsdorf, S., & Shigeto, A. (2007). Subtyping stuttering II: Contributions from language and temperament. Journal of Fluency Disorders, 32(3), 197-215. Bauer, J. J., Seery, C. H., LaBonte, R., & Ruhnke, L. (2007). Voice F0 responses elicited by perturbations in pitch of auditory feedback in individuals that stutter and controls. The Journal of the Acoustical Society of America, 121(5), 3201. Seery, C. H. (2005). Differential diagnosis of stuttering for forensic purposes. American Journal of Speech-Language Pathology, 14, 284-297. Seery, C. H. (1998). Reliability of judgments of stuttering and disfluency in young children’s speech. Journal of Communication Disorders, 31(3), 245-260. Seery, C. H. (1998). Stuttering, stressed syllables, and word onsets. Journal of Speech, Language, and Hearing Research, 41, 802-808. Seery, C. H., & Prins, D. (1994). Word familiarity, syllabic stress pattern, and stuttering. Journal of Speech and Hearing Research, 37, 564-571. Prins, D., & Seery, C. H. (1992). Constancy of interstress intervals in the fluent speech of people who stutter during adaptation trials. Journal of Speech and Hearing Research, 35(4), 799-804. Seery, C. H., & Yairi, E. (1991). Clustering of disfluencies in the speech of stuttering and nonstuttering preschool children. Charles Healey, E. (Ed.). Readings on Research in Stuttering, 31, 228-233. Title: Subtypes and Associated Risk Factors in Stuttering. Subcontract from the University of Illinois (Urbana-Champaign) for $666,039. Leadership Award (2013, May 10) College of Health Sciences, University of Wisconsin-Milwaukee. Award for Continuing Education (2012, November) American Speech-Language-Hearing Association. Childhood Stuttering Research Program (2005) . Award for Continuing Education (2002) American Speech-Language-Hearing Association. Dean’s Research Award (2002) College of Health Sciences, University of Wisconsin-Milwaukee. Award for Continuing Education (1988) American Speech-Language-Hearing Association. Award for Continuing Education (1985) American Speech-Language-Hearing Association.